The reality show trend that rules the entertainment world has created a new kind of celebrity: people who are known for just being themselves. As an example, cast members from the controversial MTV stunt show Jackass seemed to pop up everywhere following the show's successful jump to the big screen in 2002. Jackass ringleader Johnny Knoxville had a starring role in the big-screen adaptation of The Dukes of Hazzard along with major supporting roles in Men In Black 2 and Walking Tall, while Chris Pontius and Steve-O had their own nature show, Wildboyz, on MTV2. Meanwhile, skateboarding virtuoso Bam Margera made a name for himself not only through Jackass, but through a series of underground skateboarding videos and his show Viva La Bam. He's even made his own movie. That direct-to-video flick, Haggard, just may be the weirdest vanity project ever made. Ryan (Ryan Dunn) can't catch any breaks. He's completely obsessed with his cheating ex-girlfriend Glauren (Jenn Rivell), even though their relationship is long over. Ryan just refuses to let go, and incessantly tries to push his way back into her life. When he discovers that Glauren has hooked up with a sleazy headbanger named Hellboy (Rake Yohn), he absolutely snaps. He becomes so infuriated that he recruits his friends Valo (Bam Margera) and Falcone (Brandon Dicamillo) to help give him some closure on things. Valo and Falcone think he's crazy, but when he offers them each a hundred dollars to vandalize her house, they can't say no. In the meantime, Ryan flirts with insanity. He has a run-in with a police officer (Tony Hawk) while blowing off steam, he frquently butts head with his roommate (Don Vito), and even gets stabbed in the eye with a fork. Even after Ryan commissions Valo and Falcone to break into Glauren's house and find concrete proof of her indiscretions, they continue to push their friend into finally moving on for good. Part comedy, part music video, and part skateboarding exhibition, Haggard is a true oddity. The film was directed, edited, co-starred, and co-written by Margera, and he has put together a quite bizarre piece of work with this one. If Adam Sandler's films are vanity pieces, then Haggard is an insanity-vanity piece. The cast is made up almost entirely of Margera's friends and relatives, features extensive skateboarding montages, and is set to music from bands that Margera is invoved with or religiously listens to. Margera's character is even named after Ville Valo, the lead singer of Finnish rock band HIM, Margera's favorite band. All of this makes Haggard seem like little more than an elaborate home video. Yet, when the film can stick to the main story, which seems to run for only about half of the movie's 96-minute running time, Haggard is actually quite entertaining. Dunn's acting is very good, considering Haggard is the first movie that doesn't require him to do insane stunts. His character is easy to identify with, and even feel sorry for. Meanwhile, Margera's acting is decent at best, but his ability for writing (he co-wrote the movie with Dicamillo and Chris Aspité) and directing shine. Naturally, he takes time to show off his skateboarding prowess. While it may fit in perfectly with the chase scene, the various montages of him skateboarding really don't fit in with the rest of the movie. However, Margera is a far better director than he has any right to be. The film boasts rich colors and gorgeous cinematography courtesy of long-time Margera collaborator Joseph Frantz, and though the time-lapse effect is far too overused, the editing keeps the movie at a fast pace so nothing really drags. The third member of the movie's main trio, Dicamillo, is the movie's true comic relief. He primarily plays Falcone, but shows his comedic talent with no less than four other minor roles. He steals many scenes with his frantic delivery, and gives us many memorable lines and moments. Also worth noting are Chris Raab and Margera's uncle Don Vito, both of whom turn in hilarious performances as Falcone's weirdo cousin and Ryan's hedonistic roommate respectively. The movie contains some funny and insane moments, and like Jackass, the viewer finds themselves laughing in spite of themselves. 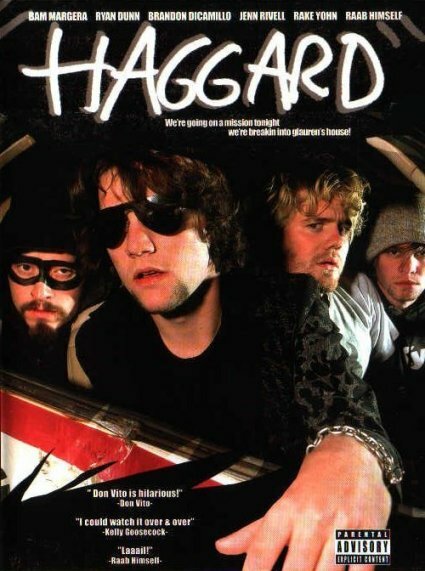 Comparable to an Kevin Smith film on LSD, Haggard is a low-budget independent movie that actually does something different, and is all the better for it. Haggard is one of those films which has no right to be as good as it is, but is light-years better than anyone would ever expect. It's definitely cheap, both in production and execution, but it contains quite a bit of energy (which is helped by funny cameos from various pro skateboarders, as well as a killer soundtrack) and draws legitimate at times. If Margera could have cut back on all the skateboarding and musical montages, it could have been the next Clerks. I mean, it seems like at least sixty percent of the movie is just meant to show off that Margera can skateboard and use time-lapse photography equipment. As it is now, the movie is simply an oddity that I doubt will gain much of an audience outside of diehard fans of Margera's crew. However, I recommend it if you're at all interested in seeing a group of former Jackass cast members make an actual movie, if you're a fan of independent comedies, or if just need a way to kill some time and have a few laughs for an hour and a half. For that, I'll give Haggard three stars.